This was hot of the presses, for my "gangster" Christmas cards from a couple years ago! Mexican, Swedish, Danish, Irish, Native American, Spanish, English...and I'm sure some random other fun ones! and HAPPY NORMAL SIZE ANKLE DAY!!! Take it easy Kandee your beautiful, perfect, awesome, super intelligent body is healing. Happy Cinco de Mayo to you too! Keep up the smile, everyone hopes your leg will be all better quite soon! You inspire me with your perseverance, joy, and cheerfulness... I love reading your blog VERY much and i always encourages me! Kandee I would like to try your enchiladas & tortillas even if they're not round. i would love to see the video of your chola look. lean like a chola!!! I was going to get all chola-ed out today but I slept too late. Plus in this city... if you dress like that, you'd better be one lolol!!!! I hope your leg feels better!!! I've passed out twice and it is HORRIBLE. the first time I was in the middle of best buy and I passed out... and I peed my pants. Lovely. I was soooo embarrassed, I cried on the way home and I was so scared. I was 11 weeks pregnant when that happened so i was so worried!! form one make-up mama to another Happy May and may that leg hurry up and heal !!!! peace, luv and matte eyeshadows , babe ! Kandee you are amazing, and an inspiration to us all. Seriously your videos and blogs always make my day. It's like having your own personal piece of susnhine!!!!! Kandee, you're missing hickies on the neck. Now that's just gangsta. Kandee your missing hickies on the neck…now that's just gangsta. OMGosh, your leg looks painful, but your face! So beautiful, love reading your blog. OmG Kandee my mom is from Chihuahua as well as my brother, tho I can't really cook but my mommma and my grandma can. Anytime you have unusual swelling, discolouration, or abnormally high pain you should call or see your doctor. It is important to keep moving, even if it hurts. wiggle your toes move your ankle around without disrupting your cut too much, etc. I don't want to scare you or make you think you have this, but it is possible to develop something called RSD from any kind of injury. If caught early it is easier to treat. But as a mexican let me tell you that we dont like "cholos" or "cholas" very much... :/ in fact we dont like that stereotype, we kinda think like "man, is cause of people like you that some Americans think like that about us..."
So, we mexicans are not proud of "cholos" and "cholas" cause they usually are involved with drugs, gangs, killings, and other sad stuff. In fact a life in mexico city is not very different form a life in a big city in america. I even have a friend that when i say to her "lets go to mexico" she says.. "oh no its a very big city!" dont forget i love you! Kandee, my great grandma was born in chihuahua Mexico too! Maybe we are distant relatives! Ha ha. Your positive attitude through your whole leg ordeal has been very inspiring. Feel better soon! Happy Cinco de Mayo to you as well, Kandee! Don't worry my tortillas are never round either, LOL. @ Pato, the chola post was nothing to do with cinco de mayo, it was just coincidental, and supposed to be funny, my family is from Mexico...I know the difference between cholo's and hispanic peeps, this was just meant to be funny....none of my family members are cholo's, but this was just funny, even my Mexican grama thought this picture was funny! Love you, Kandee!! Wish you to get better!!! Can't wait for the new video!! In my city you see all kinds of styles. I was raised in Anaheim Ca. 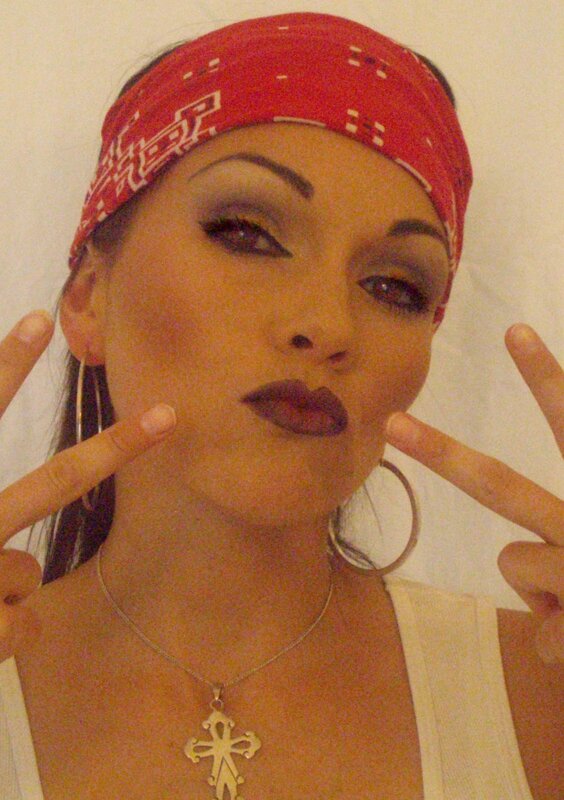 And i Grew up around cholos, cholas i love the stlye and the makeup. One of Gwen Stefani's inspiration for her style while she went to high school here. My style is mixed up and its so much fun, thats crazy Kandee i would of never thought you great gandma was from Chihuahua Mexico..well kandee take care much love and respect.